RCD will be fitted in lift up lid window, top left corner. 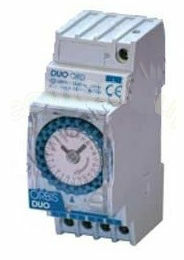 Note: Selected type of time switch in this section will be used for other timed outputs. 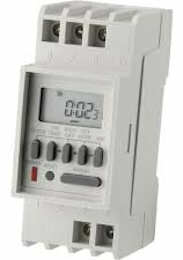 In plastic panels a three position timed off/constant/on switch is fitted on the din rail as standard on the right of the time switch. Rotary switches can be provided on the lower front of the enclosure. Rotary switches will have an engraved back plate as can be seen on the main page. We would always recommend that there is a house end switch to be able to turn on/off pool heating so that it is easy to control the energy used if you are not going to be swimming for a period of time. Add RF/WiFi light switching with up to 4 button keypad?